Amidst all of the plights and struggles of today’s student body in the wake of the “Moving Dartmouth Forward” initiative, we should not forget why the administration chose to changeeverything in the first place: Dartmouth’s decision to open education to women in the 1970s. It seems obvious that the matriculation of women, beginning in the fall of 1972, has sent the College downhill in so many ways, causing thepatriarchy old traditions to fail. 1. Dartmouth women are always hogging the spotlight. Mindy Kahling, Shonda Rhimes, Connie Britton,Rachel Dratch, Kristen Gillibrand, I mean c’mon guys, we get it, you’re successful women. But do you have to be amazing role models, too? Do you know how long it takes to memorize ALL the lyrics to a new song? How are men of Dartmouth supposed to protect their fragile masculinity if they can’t come together and revel in the glory of being loyal, chivalric and sturdy sons of Dartmouth? 3. Women have caused the untimely failure of so many old and respectable traditions. Hums – because we all need more songs that call women “cohogs” (and some unpublishable words) in our lives during Green Key! Queen of Snows Pageant – because men of Dartmouth definitely need a real-life Elsa to catcall and objectively berate admire during Winter Carnival! Tubestock–because all thatestrogen was definitely polluting the Connecticut River. The Winter Carnival Snow Sculpture–It is a little known fact that women have a higher core temperature than men. Higher core temperature = global warming = less snow = no snow sculpture. That’s just the transitive property at work. 4.Women ruined the Greek system and fraternities. 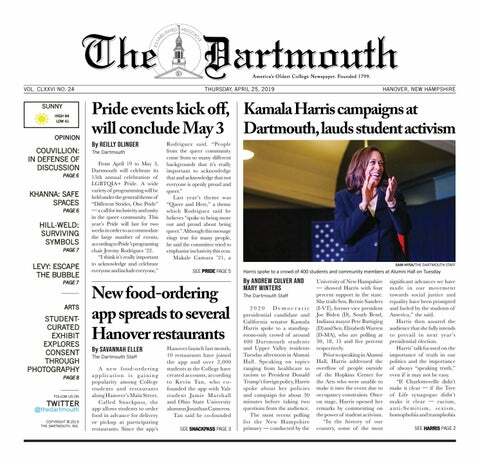 Ever since women joined the student body and introduced into the Dartmouth social scene, long-standing ~Dartmouth Bromances~ have beenjeopardized. After all, the frats were “the last bastion of male solidarity.” I mean, the admin totally forced GDX into letting girls join, and now their house is just overflowing with sisters. 5.Women are simply a distraction in extracurricular activities. Obviously.Exhibit A: The Dartmouth Decibelles used to be called the Dartmouth Distractions. 6.Women being part of the student body overcrowds the dining halls. Whether it’s the 1970s Thayer Crisis of an overcrowded dining hall or the obscenely long lines at Collis and KAF, women are to blame. I mean, can't a ~Man of Dartmouth~ just get a kale salad and vanilla soy latte without waiting, like, 5 hours?! 7. Women caused LNC to change the chicken tenders. I definitely read on Yik Yak that women were all like, “These chicken tenders are too crispy and delicious, and what’s with them having the texture of real chicken meat?” Collis eventually gave into their demands and brought in the new chicken tenders, which are the worst thing to happen to Dartmouth since, well, it starting letting in women.